Sowa or Soya is Dill leaves and is also known by the name of Shepu, a fragrant winter herb that is used liberally all over UP. Sowa methi is a popular combination of flavours and works great when making a sookhi subzi with alu, even the sowa methi ka paratha is so good you never get bored of this herb. But the most popular will be this alu sowa ki bhujia and even alu sowa ki subzi with minor variations. We have been enjoying a lot of sowa this season too and had alu sowa in many variations. It will not be fair if I don't share all those alu sowa recipes here. Here is the alu sowa ki bhujia to start with. It tastes great with Indian meals in general, great with plain hot parathas, dal chawal meals but you would be surprised to see the response when you serve it like a warm or even cold salad. Potato and dill salad like this can be had on its own and can become a sandwich stiffing. Peel and cube the potatoes in bite sized pieces. Heat oil in a pan or kadhai. Add the cumin seeds and methi seeds and wait till they turn aromatic and pinkish brown. Add in the green chillies and the cubed potatoes in quick succession. Toss and fry on low heat till the potatoes get some brown spots and get dehydrated a little. 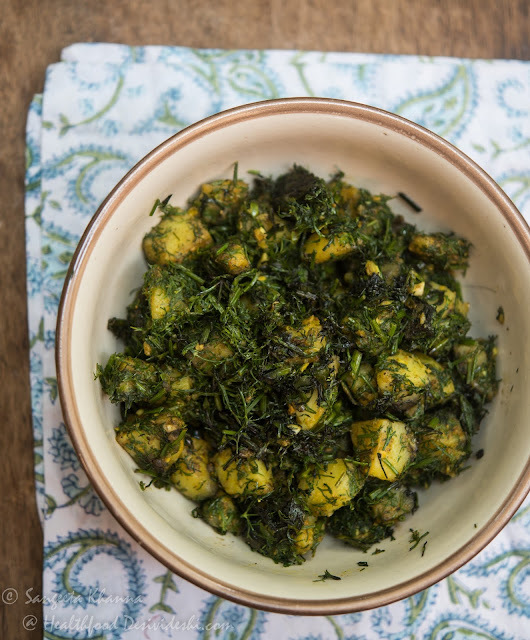 Add salt, turmeric powder and toss and stir for a couple of minutes, add the chopped dill leaves and keep tossing and mixing till the dill leaves get wilted completely and coat the potatoes well. Sprinkle amchoor powder as per taste if using. Serve hot right away or serve it cold. It is great any which way. 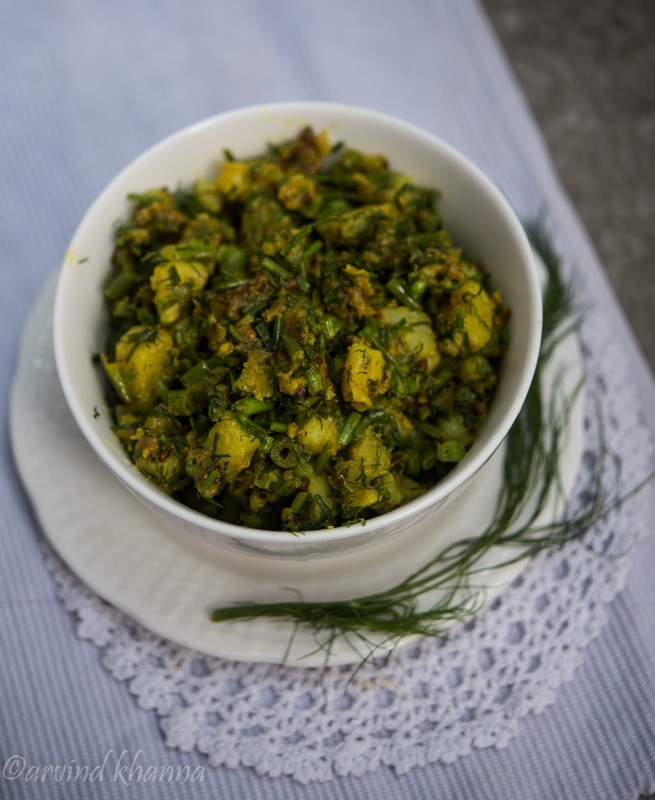 The other type of alu sowa ki subzi is cooked using raw potatoes and is more of a creamy mash infused with lot of dill leaves. I use all the tender stems of dill in this version too. Heat the mustard oil and tip in the methi seeds. Wait till it becomes aromatic. Add the green chillies and cubed potatoes, mix salt and turmeric powder, cover with a filling lid and cook on low flame for 6-7 minutes or till the potatoes are cooked. 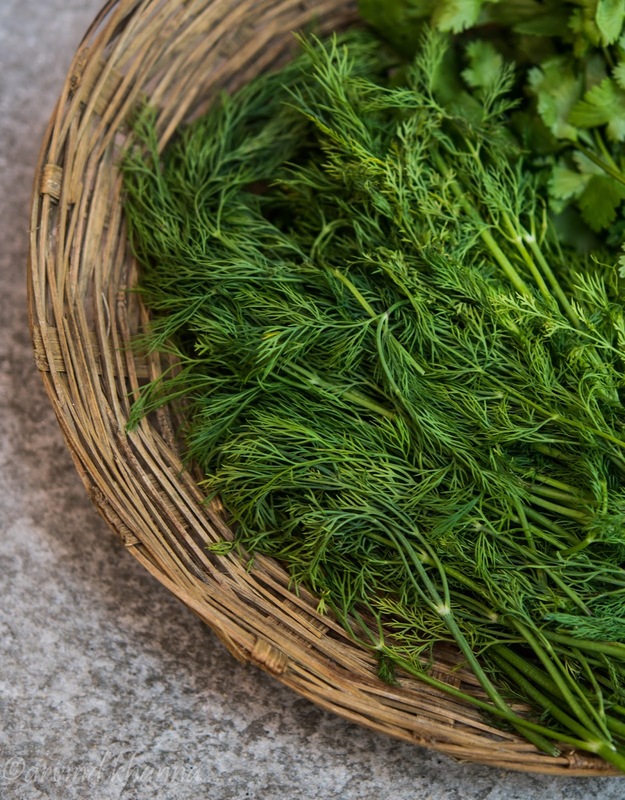 Now add the tender stems of dill, mix well, add pepper powder and cover again to cook for 2-3 minutes. Add the dill leaves, toss and mix. Thrash with a wooden spatula a few times to make the potatoes mush up a little. The dill flavour will infuse beautifully in the potatoes. Serve hot or cold, as a subzi or a salad or any which way you want. Served with some grilled piri piri chicken wings we loved it for dinner last week. The leftover was used in alu paratha the next day and that was great too. Make some alu sowa ki bhujia or alu sowa ki subzi while the season lasts. Dill freezes well in ziplock bags so you can save some of the season's bounty but the new winter potatoes cannot be saved. Make some alu sowa now, bhujia or subzi you can decide according to your taste. Hi Sangeeta, subzi looks very tempting. I have only used sowa twice in my kitchen :( found the flavours too overpowering, may be bcoz it is not something I grew up eating. Everytime in Indian grocerry store i pass sowa i feel like grabing it bcoz it looks so refreshing and smell so gud....may be mixing it with methi or making sowa prantha might do the trick for me....will surely pick it up next time i'm at store.